After a tough 4-3 loss in overtime Wednesday night, the Winnipeg Jets will play their second game in two nights as they face the lowly Ottawa Senators for the first time this season. 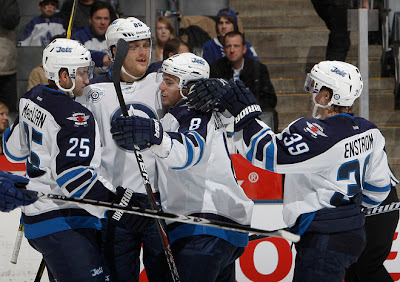 The Jets got goals from Tobias Enstrom, Alexander Burmistrov, and rookie Mark Scheifele in the 4-3 loss to the Leafs and finally got their power play on track with two goals on four opportunities. While the Jets have been able to grab three out of a possible four points in their last two games, the Ottawa Senators are headed in the opposite direction. Under the rule of rookie head coach and former Winnipeg Jet star Paul MacLean, the Senators only win this season so far came via the shootout on October 11th against Minnesota. The Sens last game was a 7-2 drubbing at the hands of the Philadelphia Flyers on Tuesday at home. Ottawa has been outscored 16-30 so far this season and sit in last in the Eastern Conference. Despite the Sens poor record, Erik Karlsson leads the team with eight points (one goal, seven assists) through six games, while Jason Spezza (five points in six games) and Milan Michalek (five points in six games) have helped the Sens offensive efforts. Still a young team similar to the Jets, they both have something to prove tonight in Ottawa. Game time is 6:30 PM CT.